For the past five years, I have been recording my weight daily. This year, I’ve finally given up on weighing myself daily, and have reduced it to weighing myself weekly. As part of the change, I have finally combined the logs from the different years into one. This has allowed me to track how my weight has changed over this time, and not just over a one year period. 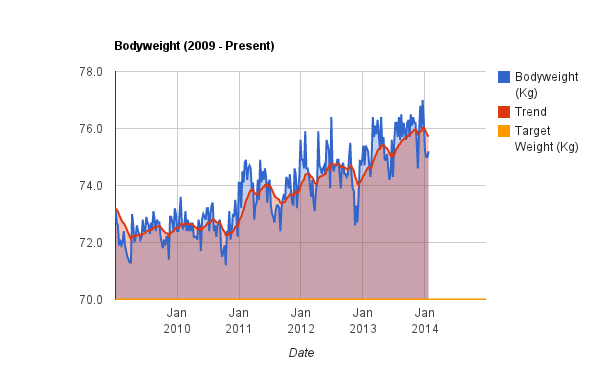 Despite a plateau from March 2009 to October 2010, my weight has been rising over the past few years. Each year, my weight generally peaks at the end of December. Despite a number of periods of brief weight loss (generally due to illness), I consistently regain and gradually increase my weight. I need to lose weight. And it is going to take time to lose it. After all, it has taken over 3 years to add it. You can track how my weight changes via my bodyweight log.